Deck cleaning is not a job that most people want to think about, but if you keep the deck clean, it will look like new and last longer. Looking for deck cleaning tips? Asking for some advice from a hardware store or from the contractor that installed your deck can help you decide to do the cleaning yourself with a deck cleaning kit or to hire someone to do it for you. Deck cleaning can be done by using a power washer. This machine forces water and soap through a wand or hose so that the contents come out fast and hardunder pressure. The pressure washer gets the dirt off the surface. If a deck isnt finished with stain or varnish or if it is old and the finish is worn, then a pressure washer might also remove some of the stain. 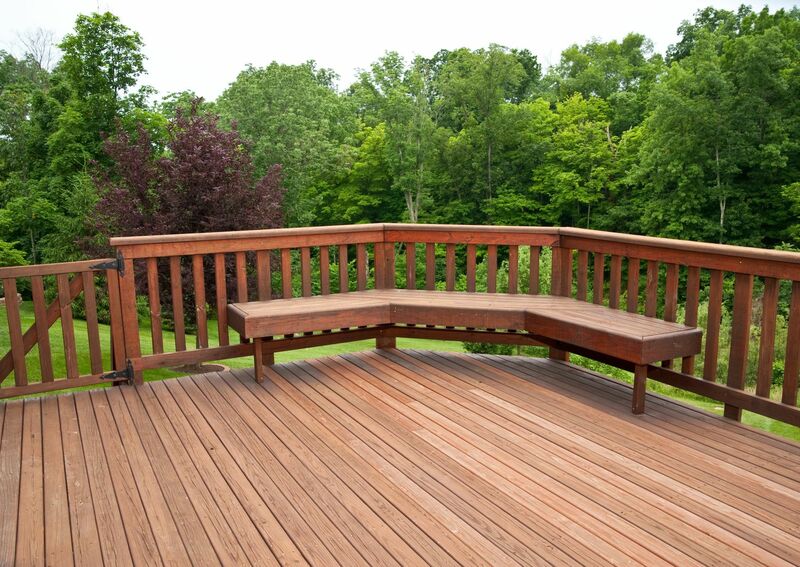 A weather-beaten deck needs to be cleaned before re-staining. Spray a cleaner onto the deck in a water and cleaner mixture and let it soak in for a few minutes. Scrub with a stiff wire brush and then rinse off with a hose. Spraying the deck with a borate mixture will kill any algae that might grow on the wood. Let it dry for several days and then apply stain and varnish to the wood. If you need the sprayer for the deck, then buying a deck cleaning kit that has a one gallon sprayer, the long handled bristled brush, disposable gloves and goggles could be a good way to get all the equipment. This type of kit may be around thirty dollars to buy and then the cleaners or chemicals are extra. They can run about forty dollars for some. Making sure you know how much to mix is important, so know how large an area you will need to clean before mixing or buying the chemicals. With the measurements of your deck, you can check out the prices of the cleaning services that will come and clean your deck with a really high power washer. Getting a price quote to know how much of a difference it will be between doing it yourself and hiring a service makes sense. For some people, saving them from doing the labor is worth the extra money to hire someone to do the job. Once you have the items that you need, then you can get going on the project. If you need some deck cleaning tips, there are websites that specialize in deck maintenance and cleaning. Places like the diynetwork.com can offer some good ideas. Some contractors that can do the deck cleaning for you as one of their services might also list some ideas to help you complete the task. Some sites offer eco-friendly ways to clean and care for your deck and so they might be worth looking at before you purchase chemicals to clean or refinish, too. If you have small children or pets then the less caustic the chemicals used, the better. Deck cleaning is a chore that can pay off with a nice looking deck for a long time. With the right equipment, like a sprayer or a power washer, then you can do the job much easier than by hand. Some services will do it for you. If you have recently put in a deck, ask the installer for tips on how to keep the deck looking clean and keeping it in good shape. If you keep up with this maintenance project, then youll be sitting on your deck with a glass of lemonade and a book in no time at all.